Shortly after his arrival at Box he organised a Fete And Pageant at Hazelbury Manor to raise money for church renovations and improvements to the Bingham Hall. A handbook sold at the fete still survives and is itself a potted history of Box and includes the names of many local participants. On the day of the fete, George gave A Humorous and Musical Entertainment at the Bingham Hall admission 6d, with an advertisement announcing 'The audience may leave at the end of the entertainment, unless they have already done so'. George it appears possessed that human touch with an ability to laugh at himself. His legacy to Box must be that of humanising the clergy by many hours of entertainment and merriment both on the Fete Field with Box Lions and in the old Bingham Hall. Both George and his wife, Kate, had a passion for the stage. They organised and performed in entertainments at the old Bingham Hall - so named after DG Bingham, a railway clerk who went to Holland and made a fortune on the railways there and paid for the hall to be built. These entertainments were charitable functions to raise money for a variety of good causes, including the Box Lions of whom George was an enthusiastic member. George's love for the theatre even involved him in the outwardly-glamorous but sometimes sordid world of the music hall - he was chaplain to the old Palace Theatre in Bath (this was situated opposite the Theatre Royal and is now a bingo hall and social club). Some afternoons, an odd assortment of characters could be observed entering the vicarage to take tea when George and his wife held little gatherings to which artists performing in Bath were invited. Many famous artists of the day attended including Tex McCloud (spinner of ropes and yarns), Claud Dampler (he had a musical act in which Claud started playing conventionally enough but ended up underneath his instrument), and another George Foster who was known as The Vicar of Mirth. Few people living today have heard of these names. 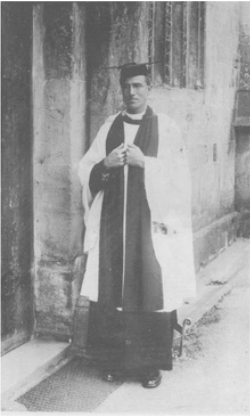 The Reverend George Foster ended his ministry as sequestrator and clergyman-in-charge at St Leonards-on-Sea. When George departed Box in 1935, Great Britain was again drifting towards a military conflict which made his time in the village seem even more ideal. What happy memories Box conjures up for us. The services for Publicans and Sinners at 9.45 on Sundays; services in the Northey Arms’ grounds with Bishops and the Corsham Town Band; Hazelbury pageant; The Way of Compassion; the Box Blackbirds with Roddy Hughes giving excerpts from his extensive repertoire, Mrs Gorringe’s Necklace, Dolly Reforming Herself, the concert parties, Some Rubbish, More Rubbish and Still More Rubbish. Then there were the many Passion plays and Nativity plays which Kate wrote for the Box Players’ Guild.